Ideal for reception areas or waiting rooms. Textured powder coat finish, Gray. 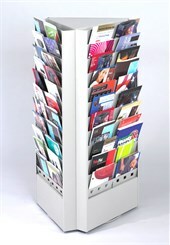 Steel Rotary Rack is three sided and rotates 360 degrees for total access to all literature. Features a removable divider that converts the display from 66 - 6-3/8"W pockets to 33 - 12-3/4"W pockets. Measures 17-1/4"W x 15"D x 30-1/4"H overall. Shpg. wt. 47 lbs. PRICE INCLUDES FREIGHT! Please allow 1-2 weeks for delivery.